To the east of I-25 and north of King’s Deer is a working ranch that will remain in its natural state. To the west of the I-25 is the Greenland trail that is open to the public and has a trail loop of 8.2 miles. Since the trail is four feet wide in most areas it allows for horses, mountain bikers, runners, and hikers. Many other recreational opportunities await residents of King’s Deer to the east with Black Forest—a well-established domain offering horse properties and large acreage lots, and also home to Fox Run Regional Park. To the southwest running through the 18,000 acres of the Air Force Academy is the Santa Fe Trail. Lots of open space, trails, and ponds to celebrate Colorado’s 300 days of sunshine every year. This is outdoor Colorado at its finest! Families who are looking for the educational well-being of their children will find the excellence they are looking for in Lewis-Palmer District 38. Committed to the “Pursuit of Excellence” Lewis-Palmer schools combine the benefits of small community comfort with state-of-the-art instruction providing students with the skills necessary to find success in the 21st Century. For more information visit www.lewispalmer.org. 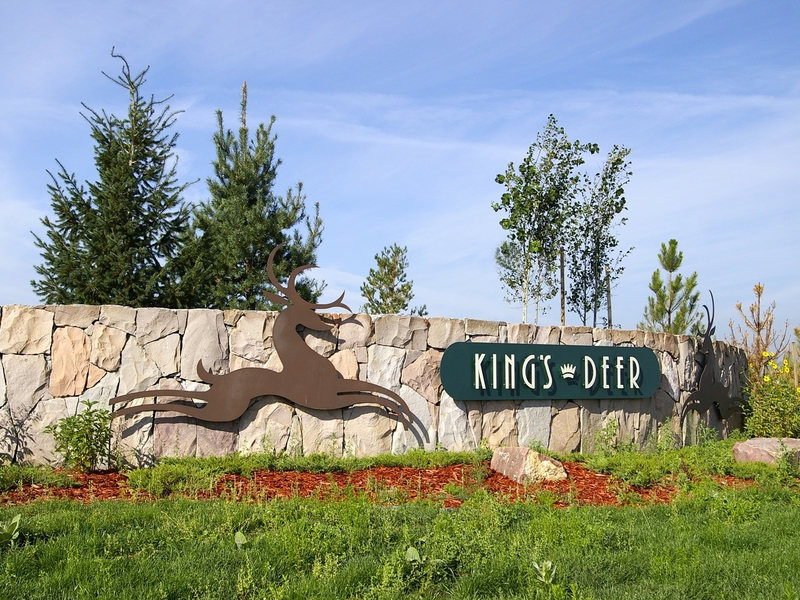 King’s Deer properties are spacious (lots average 2.7 acres each), offering privacy without fences and that sense of community among its populace. Some homes with great views are located on open grasslands while others are on secluded lots tucked away under tall Ponderosa pines. It’s a country setting with the closeness of fine neighbors. Home prices range from $500,000 to over $1,000,000.